Le Sentinel Pine est l’un des derniers grands domaines de l’Ouest occidental. Ses cinq bâtiments sont situés sur 20 acres avec près de 1200 pieds de front de mer sur le magnifique lac Swan et peuvent accueillir jusqu'à 25 personnes. Situé dans la partie nord-ouest du Montana, à seulement dix minutes de la charmante ville de Bigfork et à moins d’une heure du parc national des Glaciers, il est également facilement accessible par les compagnies aériennes commerciales. Nous proposons des logements et des équipements spectaculaires dans l’un des plus beaux environnements privés d’Amérique. Notre décor majestueux et la beauté sereine au coeur des montagnes Rocheuses fournissent une expérience inoubliable one-of-a-kind escapade. Le Sentinel Pine est disponible à la location pour certains groupes de la mi-juin à la mi-septembre sur une base hebdomadaire (en fonction des disponibilités, nous pouvons accepter des séjours plus courts). Nos clients ont accès à l'ensemble du domaine car nous ne louons pas d'immeubles individuels. NOTE CRITIQUE: Jusqu'à ce que VRBO modifie récemment ses politiques afin d'empêcher le dialogue direct, nous avons parlé directement avec les locataires potentiels avant d'envisager une location. Avec ces changements de politique, envoyez-nous un e-mail à tour de rôle pour que nous puissions commencer à vérifier mutuellement la possibilité d’un ajustement via le système de messagerie de VRBO. Au total, nos cinq bâtiments principaux comprennent 14 chambres séparées avec un total de 23 lits (3 lits king size, 7 lits queen size, 11 lits simples et 3 lits gigognes). Les cinq bâtiments sont confortablement séparés les uns des autres sur cinq hectares de pelouse magnifiquement entretenus avec un court de tennis. Il existe également un terrain adjacent de 6 acres qui peut être utilisé comme terrain de baseball, de volley-ball, de football, de practice de golf ou similaire. Deux des bâtiments ont également des patios et des porches qui font face au côté ouest du lac et offrent une vue imprenable sur le coucher du soleil. De nombreux clients de notre propriété au bord du lac bénéficient de sports nautiques. Bien que nous ne louions pas directement de bateaux à moteur, des locations sont disponibles sur place et nous fournissons des installations d'amarrage et des équipements de sports nautiques. Bigfork, à moins de 15 minutes de The Sentinel Pine, est l’une des villes les plus charmantes de l’Ouest occidental. Sur la rive du lac Flathead, le plus grand lac d'eau douce de la moitié ouest des États-Unis, cette ville pittoresque compte plusieurs dizaines de restaurants - dont beaucoup sont connus au niveau national et présentés dans de grands magazines de voyage - et constituent un paradis pour les artistes avec une multitude de galeries et de magasins. Le Bigfork Playhouse est l’un des plus beaux théâtre d’été du pays. Bigfork et sa ville soeur, Whitefish, à 40 minutes au nord d’elle, sont de véritables «joyaux» de l’ouest. All that we had hoped for. We had a fabulous time at Sentinel Pine! It was truly a dream come true. We wanted it to be special because we were celebrating our 50th anniversary and in every way it could not have been better!! Our group consisted of 5 families, with 10 adults and 15 cousins from 9 to 21 years old. The accommodations really worked out well and gave the children a chance to sleep over with a different family when they wanted. The children and the adults were not on their cell phones and we didn't even think about TV. We felt like we had our own private camp...the kayaks, row boat, paddle boards, fishing poles, diving board and all the sports equipment were used. They had a wonderful time playing and exploring, skipping rocks, catching crawfish, fishing, playing tennis, looking for arrowheads, swimming and then staying up in the main lodge until the wee hours of the morning playing poker. We also had a great time going into Glacier National Park, rafting and horseback riding. Going to the Big Fork Summer Playhouse was a real treat and both children were really impressed with the quality of the production. Tom (the onsite caretaker) was very attentive to our needs! He could not have been more helpful in his suggestions for hiking trails and just answering any questions we had. He took Bob and I out to pick huckleberries so the next morning we made huckleberry pancakes for everyone. That was truly a Montana treat!! Wanted to personally thank you again for the extraordinary week our group spent at your Sentinel Pine property. We get together every year, are very close and are not easily impressed. But we met our match this time. We have people of all kinds – single, married with kids, married without kids – you name it. We never had our get together out West, let alone in a place as evocative, accommodating and impressive as yours. Everyone was overwhelmed and had an amazing time, including the young kids, who will have unforgettable memories of that week for the rest of their lives. From the gorgeous main lodge, to the charming cabins, to the extraordinary lake, to the attention to detail in every field, nook and cranny, to the amazing environs (Glacier, Jewel Basin, Bigfork and much, much more) we couldn't have asked for a more unique and special experience. Your caretaker Tom, who has been in the hospitality business for years, was incredibly attentive to all of us and wonderfully sensitive to the needs and nature education of the kids. A vacation like this is not inexpensive, but the joy and camaraderie that your remarkable property brought to each and every one us will stay with us for a very long time – it is a remarkable value. Thank you again for enabling us to share this magical place, which is so clearly infused with the love of the family that has nurtured it for generations and which stands today as the sentinel that it is: an indelible and majestic part of the history of its spectacular surroundings. If you're looking for a Montana adventure that includes Glacier National Park, Fishing, hiking, wildlife, etc. or just want to disconnect and get away from it all then Sentinel Pine is the place to stay. We started our days with coffee on the huge porch overlooking the pristine Swan Lake and ended our days with dinner on the huge 20 foot long handmade dining room table. Deserts consisted of a glass of Red on the dock while watching the fish jumping during incredible Montana sunsets, or a good book, a toasty fire in the huge main lodge fireplace and a cocktail. (You'll sleep like a baby every night!) In between we experienced the all the beauty western Montana has to offer including Glacier National Park, fantastic fishing and kayaking on the Swan and Montana wildlife of just about every kind. While en-route to Montana I was offered advice by 2 different people at 2 different airports to fish with the same guide. How could I go wrong! During the full day float trip down the Swan River I boated 15 fish from 5 different trout species. This was definitely a bucket list trip! Sentinel Pine is a cozy and well maintained private home on the shores of Swan Lake which is surrounded by snow caped (thru Mid June) mountains. The two main buildings are beautifully handcrafted traditional log cabins and decorated in a manner that bring you back to a simpler time. 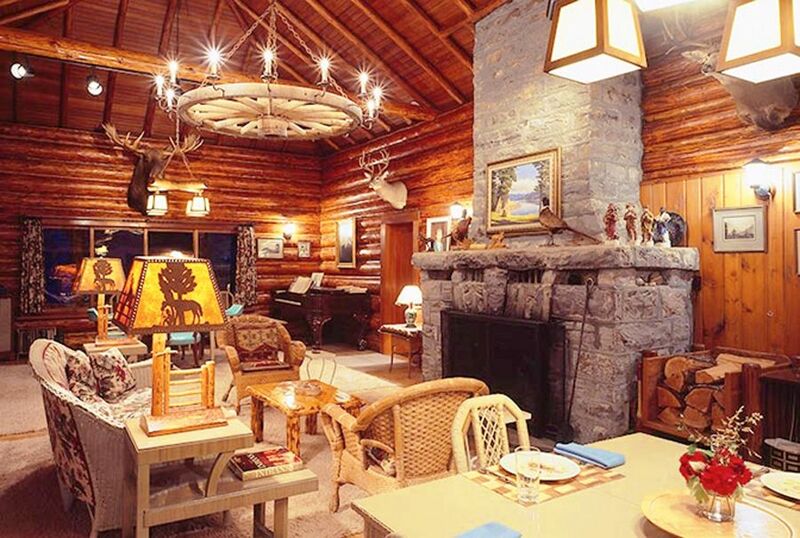 The décor, especially the wide wrap around porch of the main lodge brought back memories of my grandparents and growing up in the 60’s and 70’s. Thanks to the owners and their caretaker, we had the best vacation in years. What a special place. WE HAVE NO FIXED RATES AS ALL RATES THUS ARE CUSTOMIZED IN NON-FORMULAIC FACTORS SUCH AS RISK. WE CANNOT GIVE YOU A SPECIFIC NUMBER UNTIL WE HAVE COMMUNICATED VIA VRBO EMAIL, BOTH FOR SECURITY REASONS AND TO BE CERTAIN THERE IS A GOOD MUTUAL FIT TO GIVE YOU A ONE-OF-A-KIND TERRIFIC VACATION. EMAIL US BEFORE TRYING TO BOOK SO WE CAN DETERMINE WHETHER THERE IS A MUTUAL FIT, AS WE CANNOT ALLOW BOOKINGS WITHOUT THAT DETERMINATION. JULY AND AUGUST RATES ARE GENERALLY IN THE $2,000-$2,500 PER DAY RANGE, JUNE AND SEPTEMBER TEND TO BE LOWER. WE ARE A VERY COST-EFFECTIVE SOLUTION FOR LARGER GROUPS IN THE 22-25 PERSON RANGE (OFTEN IN THE $80/NITE/PERSON), BUT WE ARE LESS COST-EFFECTIVE FOR SMALLER GROUPS. WE LOOK FORWARD TO YOUR EMAIL AND SHALL RESPOND AS QUICKLY AS PRACTICAL.